South Gallia senior Garrett Saunders makes a hit on Waterford running back George Pantelidis (21) during the first half of Friday night’s Week 2 TVC Hocking football contest in Mercerville, Ohio. Last Week: Portsmouth lost to Portsmouth West 13-0, in Portsmouth; River Valley lost to Gallia Academy 46-0, in Gallipolis. Last meeting between the teams: None since 1996. PHS offense last week: 28 rushing yards, 28 passing yards. RVHS offense last week: 121 rushing yards, 16 passing yards. PHS offensive leaders last week: N/A. RVHS offensive leaders last week: QB Jordan Burns 1-of-4, 16 yards, 1INT; RB Cole Young 4 carries, 41 yards; WR Layne Fitch 1 reception, 16 yards. 1. Off to a rough start. River Valley hadn’t began a year with back-to-back losses since 2013, with it lost its first four. Including the final three games of last season, RVHS is on its longest losing skid since losing its last five games of 2013. 2. So far this fall, River Valley has allowed 11 rushing touchdowns, two passing scores, and one special teams touchdown. RVHS has turned the ball over five times this season, with the Raider defense recording just one takeaway. 3. After a 57-point output in its Week 1 win at Valley, Portsmouth’s offense disappeared last week, committing three turnovers and averaging just two yards per play. 4. River Valley is still looking for its first points of the season. Prior to this season, RVHS hadn’t been shut out since its 2015 playoff game, and hadn’t been blanked in the regular season since 2014. This is the first time the Raiders haven’t scored in back-to-back games since 2010. 5. This is the third straight week that RVHS has played an Ohio Valley Conference opponent. So far this fall, the OVC is a perfect 5-0 against TVC Ohio opponents, with Alexander and South Point also facing this week. Last Week: Gallia Academy defeated River Valley 46-0, in Gallipolis; Jackson defeated Fairfield Union 34-0, in Rushville. Last meeting between the teams: Sept. 8, 2017. Jackson won 34-0, in Gallipolis. GAHS offense last week: 263 rushing yards, 74 passing yards. JHS offense last week: 270 rushing yards, 53 passing yards. GAHS offensive leaders last week: QB Justin McClelland 7-of-12, 74 yards, 1TD; RB Lane Pullins 12 carries, 112 yards, 2TDs; WR Cory Call 4 receptions, 39 yards, 1TD. JHS offensive leaders last week: QB Jared Icenhower 4-of-14, 53 yards, 1TD; RB Nevan Yates 5 carries, 100 yards, 1TD; WR Jaiden Spires 1 reception, 22 yards, 1TD. GAHS defense last week: 121 rushing yards, 16 passing yards. JHS defense last week: 44 rushing yards, 46 passing yards. 1. The Blue Devils are 42-41-5 against Jackson all-time, but the Ironmen have a 1382-1211 scoring advantage. GAHS last defeated Jackson on Oct. 26, 2012, by a 30-27 count in Gallipolis. Gallia Academy hasn’t won in the Apple City since 2004. 2. This marks the first time since 2010 that GAHS is off to a 2-0 start. the Blue Devils won their first four games that season. The 2010 and 2006 seasons are the only two times GAHS has started 3-0 in the last 20 years. 3. Dating back to last season, Gallia Academy has scored at least 45 points in three straight games and four of their last five. The Blue Devils haven’t achieved either feat since the 2013 campaign. 4. Six different Blue Devils have found paydirt this season, with GAHS totalling 10 rushing touchdowns, three passing scores and one special teams touchdown. 5. This is the first of three straight road games for the Blue Devils. GAHS has suffered through four straight campaigns with losing road records. The 2012 season is the last time Gallia Academy has had a winning road mark. Last Week: South Gallia lost to Waterford 41-6, in Mercerville; Federal Hocking lost to Southern 57-6, in Racine. Last meeting between the teams: Sept. 1, 2017. South Gallia won 42-6 in Mercerville. Current head-to-head streak: South Gallia has won 6 straight. SGHS offense last week: 172 rushing yards, 0 passing yards. FHHS offense last week: 54 rushing yards, 19 passing yards. SGHS offensive leaders last week: RB Kyle Northup 17 carries, 102 yards, 1TD. FHHS offensive leaders last week: QB Hunter Smith 3-of-6, 14 yards; RB Aaron Burns 6 carries, 75 yards, 1TD; WR Ethan McCune 2 receptions, 4 yards. SGHS defense last week: 72 rushing yards, 132 passing yards. FHHS defense last week: 342 rushing yards, 99 passing yards. 1. South Gallia is 7-1 against the Lancers all-time, with a 285-to-153 scoring edge. All-8 meetings between the teams have happened as members of the TVC Hocking. Federal Hocking’s only victory over the Rebels came on on September 28, 2012, in Athens County, by a 56-0 count. 2. Federal Hocking has lost 33 consecutive games, including 26 straight in the league. Federal Hocking’s most recent win came on Oct. 24, 2014, by a 16-14 count over Waterford, which has only lost five league games since then. 3. 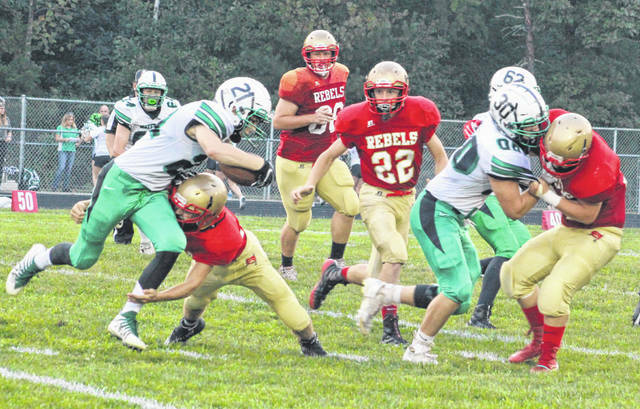 The passing game plagued South Gallia last Friday, as the Rebels were 0-for-5 with four interceptions. The Rebels also lost a pair of fumbles, while coming up with just one takeaway. 4. With the exception of Aaron Burns’ 69-yard touchdown run, Federal Hocking had a net total of four offensive yards last week. The Lancers’ only other touchdown this season was a 37-yard pass from Hunter Smith to Noah Robinson in Week 1. 5. Dating back to last season, South Gallia has lost eight straight games. The Rebels have been outscored 326-to-74 in that span. SGHS has also been on the wrong end of six consecutive road contests, dating back to the 2016 campaign.